The existence of Native cultures and Native nations and the ability of these nations to deal with problems and increase social well-being are all dependent on the existence and effectiveness of Native governments often called tribal governments. This is particularly true in the United States and Canada, but it is also true elsewhere in the Americas where Indian governments or social mechanisms receive little legal recognition. Thus, we defend and assist Native or indigenous governments when their powers are attacked or threatened. In 2007, we succeeded in winning UN General Assembly adoption of the UN Declaration on the Rights of Indigenous Peoples containing a clear right of self-determination for indigenous peoples as distinct peoples within existing countries. In 2010, the US expressed its support of the Declaration; now no country in the world opposes it. This is the most important advance in the law of self-determination in more than a generation, and it remains uncertain how this right will be in fact put into effect in the Americas and elsewhere. At present, we are working on just one case in the United States, but we are devoting particular attention to securing the right of self-determination in the context of the Organization of American States draft American Declaration on the Rights of Indigenous Peoples. It is important to win United States and Canadian support for the right of self-determination in the American Declaration, because both countries initially voted against the UN Declaration. We are also beginning to work on the implementation of the right of self-determination included in the UN Declaration. This will include seeking UN measures and mechanisms to assure that countries actually respect this right and assure its exercise. We will surely continue this implementation work in the UN and the OAS for many years to come. We are also giving special attention to the right of self-determination in our law reform work, as discussed below. We expect that in the United States the right of self-determination may well come under much greater attack by the courts and even by Congress in the next ten years. The recent Texas Federal District Court ruling in Brackeen v. Zinke, which struck down portions of the Indian Child Welfare Act and declared ICWA a race based statute, is the latest development in a long campaign by anti-Indian groups and the federal government to get rid of one of the most important principles in federal Indian law: that laws benefiting Indian tribes are based upon their classification as political or governmental units – and are not racial classifications. This is a principle embedded in U.S. law from the very beginning and explicitly recognized by the Supreme Court in Morton v. Mancari. Forty-five years ago, the Supreme Court recognized in Morton v. Mancari that without this principle, almost the entire body of federal legislation relating to Indian and Alaska Native tribes could be found unconstitutional as racially discriminatory. Supporting and defending the Mancari decision and the rule that it stands for is perhaps the most urgent and important Indian law issue of our time. The stakes for tribes are very high, because the ability of the federal government to carry out its trust responsibilities to tribes, to protect Indian tribes and their resources, and to provide programs and financial assistance to tribes, could be greatly diminished if these challenges succeed. Tribes are governmental and political entities, not racial groups. This is a principle embedded in U.S. law from the very beginning and explicitly recognized by the Supreme Court in Morton v. Mancari in 1977. This is the law of the land. The United Nations will delay any substantive action on their work to enable the participation of indigenous peoples’ representatives and institutions at the UN. After years of discussions among indigenous peoples and member states, and several weeks of states-only negotiations this summer, member states were not able to reach consensus. 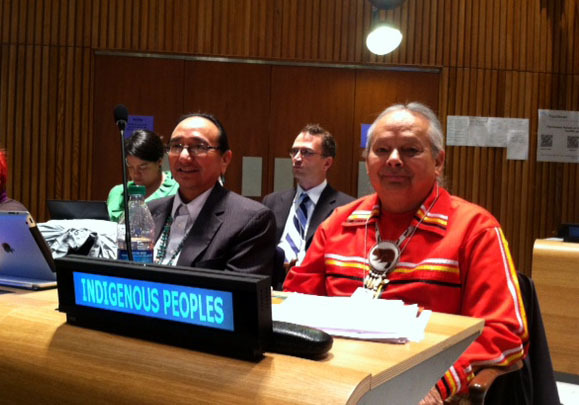 Executive Director, Robert T. Coulter, addressed the 30th session of the Human Rights Council in Geneva today recommending the swift establishment of an implementing and monitoring body for the UN Declaration on the Rights of Indigenous Peoples. The statement makes a number of recommendations about this body, including specific proposals regarding its mandate, structure, and composition. The clock is ticking for UN leaders to develop a system-wide action plan to fulfill the mandates outlined in the 2014 World Conference on Indigenous Peoples outcome document. On June 15, 2016, after nearly 30 years of advocacy and negotiation, the Organization of American States (OAS) adopted the American Declaration on the Rights of Indigenous Peoples.